The new federal tax on Global Intangible Low-Taxed Income (GILTI) is something of a misnomer: it’s certainly global and it’s definitely income, but the rest of it is, at best, an approximation. It’s not exclusively levied on low-taxed income, nor just on the economic returns from intangible property. So what is GILTI, why might states tax it, and what’s the problem with that? 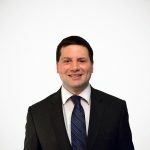 As we discuss in our new paper on state tax conformity, the 2017 federal tax reform legislation represented a significant retreat from the taxation of international income, but in many respects, the opposite effect is playing out in states due to the way state tax codes are drawn to new federal provisions. Prior to enactment of the Tax Cuts and Jobs Act in December 2017, federal corporate income taxes applied to the entire worldwide income of a firm, with credits for foreign taxes paid. Now the U.S. operates under a mostly territorial system, with a few guardrails to curb international tax avoidance techniques like profit shifting and the parking of intellectual property in low-tax countries. One of those guardrails is GILTI, which is intended to tax what are deemed the supernormal returns of foreign subsidiaries, less a deduction, less a calculated partial credit for foreign taxes paid. Let’s walk through what this entails. The new GILTI inclusion is established at IRC § 951A, and it’s imposed on supernormal returns, defined as income above 10 percent of qualified business asset investment, less expenses. The idea here is that if you’re producing something with tangible property, your return on investment is probably going to be less than 10 percent of your cost of capital. If your widget-making machine is valued at $10 million, your profits off the widgets that machine makes aren’t likely to break $1 million in a given year. But if, instead, you parked a patent or trademark in a foreign subsidiary, and then all of your other companies in the U.S. and across the world paid royalties for its use (or perhaps third parties did), then you’d have a lot of income and little or no tangible property (things you can touch and move). Basically, instead of trying to determine how much of the income of your foreign subsidiaries can be attributed to intangible property, the GILTI formula just assumes that tangible property yields “normal” returns and any “supernormal” returns are a good enough proxy for intangible income. As you can imagine, that’s a rough approximation at best, and there are plenty of reasons why there might be supernormal returns to physical capital. But that’s how GILTI works—or rather, that’s the first step in how GILTI works. At the federal level, the goal is to tax this income, but at a lower rate (reflective of the fact that it really is international income), and to take into account any foreign taxes paid. Remember, the last part of the name is “Low-Taxed Income,” and thus far, we’ve only established that it is global income limited in a way that at least very loosely corresponds to returns on intangible property. This plays out, first, with a 50 percent deduction under IRC § 250, which functionally brings the federal tax rate on this income from 21 to 10.5 percent (13.125 percent after 2025, when the deduction shrinks). Next, credits are applied for 80 percent of the amount of foreign taxes paid, though the value of those credits is subject to an overall limitation equal to U.S. tax liability times foreign profits divided by worldwide profits. In general, however, the higher the foreign tax liability, the lower the residual U.S. liability. And there you have it: a tax on global intangible low-taxed income. Sort of. Unfortunately, many states bring GILTI into their tax codes due to how they conform to the federal law. This is already a departure from what we might think of as the typical approach to state taxation, which stops at the water’s edge, but it quickly gets even worse, because state taxation of GILTI is (accidentally) far more aggressive than federal taxation. Many states conform to the corporate code before credits or deductions, thus bringing in GILTI under § 951A, but without the 50 percent deduction or the credits for foreign taxes paid. Consequently, state taxation of GILTI is not only aggressive, but lacks any pretense of only applying to low-taxed foreign income. In certain cases, state effective rates could rival the federal rate on GILTI. Some states are responding to this by exploring “factor relief” to reduce these costs, but taxing GILTI—even with, but especially without, the § 250 deduction and factor relief—is highly uncompetitive, and states should avoid it altogether by decoupling from this provision of the new law, which makes very little sense for states. Separate reporting states have a particularly compelling reason to decouple, as the U.S. Constitution forbids discriminatory taxation of foreign economic activity. If a state does not include U.S.-based subsidiaries in a consolidated group for taxation, it cannot include international subsidiaries (controlled foreign corporations) within the filing group for tax purposes. Doing so would violate the foreign commerce clause, granting Congress the sole authority to regulate commerce with foreign nations and other states, by treating international income less favorably than domestic income. Generally speaking, states include GILTI in their base unless they use state-specific income starting points or expressly decouple from it. States which begin their corporate income tax calculations with federal taxable income before special deductions (line 28 of the corporate income tax form) generally forgo the corresponding 50 percent deduction, while states which begin with federal taxable income after special deductions (line 30) generally include it, though here too, states may adjust their conformity to this specific provision legislatively. Furthermore, some states have made administrative determinations that GILTI is not part of taxable income, or that it can be fully (or very nearly so) deducted as a foreign dividend. Several states acted on GILTI taxation in 2018. 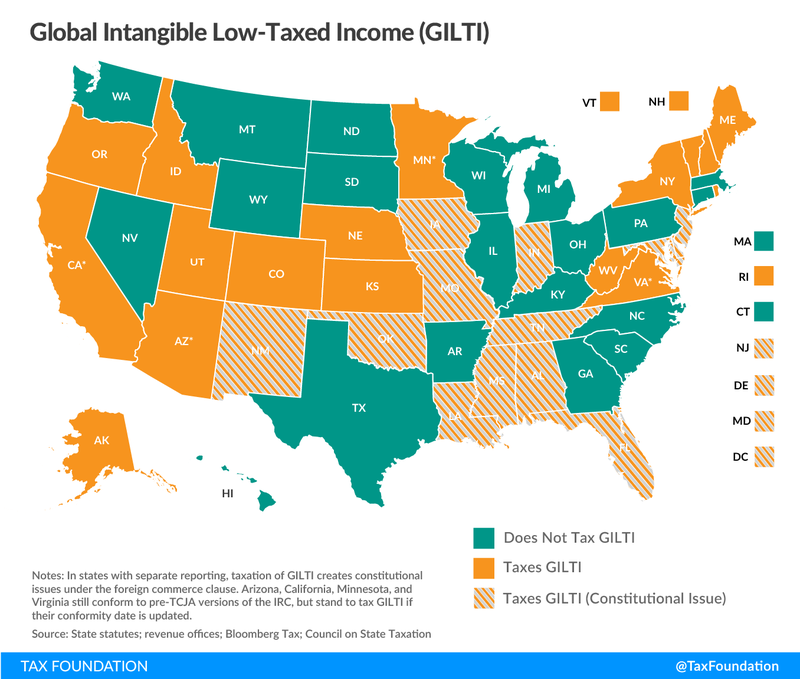 Connecticut, Illinois, Massachusetts, and North Dakota determined that GILTI could be fully offset by the dividends received deduction. Georgia, Hawaii, and South Carolina legislatively decoupled from the inclusion of GILTI in the tax base. And New Jersey adopted conformity with the partially offsetting § 250 deduction. Even now, more than a year after enactment of the Tax Cuts and Jobs Act, a significant number of states which would seem to tax GILTI (based on the way their tax codes are written) have issued no guidance to businesses. To the extent that this reflects their own reservations about including international income in the tax base, this can be a good thing—provided that states take legislative or administrative steps to establish that GILTI is not taxable, preferably by providing a subtraction for GILTI. (States can also treat GILTI as foreign dividend income and provide a full deduction under the dividends received deduction, though this approach is less comprehensive and can yield liability for certain taxpayers.) For now, however, uncertainty reigns, along with the fear that state corporate tax codes could become substantially less competitive even as the federal code has improved.